Located in Central Kentucky, the Marion County Quilt Trail is part of a tri-state project designed to decorate rural barns with paintings of quilt squares and murals of country life. Known collectively as the “clothesline of quilts”, this grass-roots project began in Ohio and quickly spread to neighboring states. Although it would be quite an undertaking to drive the entire National Quilt Trail, the Marion County leg makes a nice addition to a Central Kentucky whiskey tasting tour. There are many ways to explore this route, but here’s one itinerary that I particularly enjoyed. From Lebanon, Kentucky follow Highway 49 south, out into the country. This stretch of the highway is also known as Bradfordsville Road, as it runs between Lebanon and Bradfordsville. About five miles down the road you’ll spy the barn of D.C. and Barbara May. You can’t miss it, as it has an Ohio School House quilt square painted on the side. There’s plenty of room to pull over on the shoulder and snap a few photos of this beauty. Continuing along the highway, you’ll soon come upon the Kirkland barn at 8675 Bradfordsville Road. 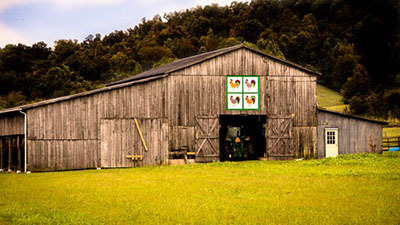 This barn displays the Dresden Plate pattern. Mrs. Kirkland picked it because in the 1930s this pattern was used on a quilt made by the students of the old Rush Branch School. It was later presented to one of their teachers, so Mrs. Kirkland thought it would be nice to preserve a little bit of the local history on her barn. From the Kirkland place, follow the highway south and take a right on Liberty Road, where you will find a barn with an unusual quilt square. Presented by the Bradfordsville Save the School and Seniors Committee, this barn features a quilt square depicting the beloved Bradfordsville school. Every quilt square has a story. Next, continue up the road and take a right on Old Lick Road. 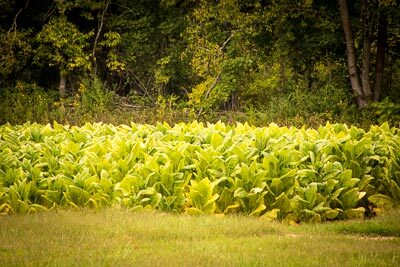 This pleasant country lane meanders past tobacco fields and pastures, before it crosses over a rustic one-lane country bridge. When you reach Mannsville Road, take a right and continue to 2300 Mannsville Road, where you’ll find Tom and Caron Tucker’s barn. Caron picked an original pattern made by Tom’s mother to adorn this barn. Just up the road at 1420 Mannsville Road the Tuckers also display a Double Irish Chain made by Frances Tucker, on their second barn. It really stands out as it’s hung diagonally. 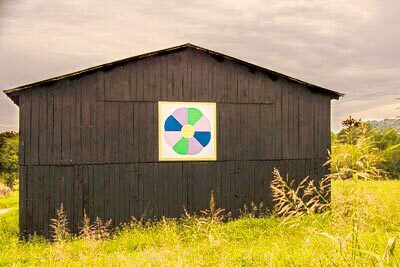 The third Tucker barn at 1250 Mannsville Road is decorated with a Rose of Sharon quilt square. It’s from one of Caron’s favorite quilts, which has been in her family for over 100 years. After you pass the last Tucker barn, continue along the road until it loops back to Highway 49, turn left, then make another left of Highway 1157. Soon you’ll come upon my favorite quilt square, on Leonard and Martha Potter’s barn at 715 Highway 1157. This rooster pattern was chosen by Mr. Potter, as his wife won’t let him have any live chickens because they are too messy. To round out the drive, continue up the road where you’ll find a very patriotic barn at 660 Highway 57. The Caldwells chose this flag design because their boys didn’t want anything sissy painted on the side of their barn. Although this is just a short sampling of the quilts along the Marion County Quilt Trail, you can certainly do the whole trail if you have enough time. Just pick up a map at the Lebanon Visitor Center at 239 N. Spaulding Avenue in downtown Lebanon. GPS coordinates and addresses are printed on the map, although I found it easier to navigate using the addresses. A word of warning — some barns are easier to find than others, but just consider it an adventure and have a little fun with it. 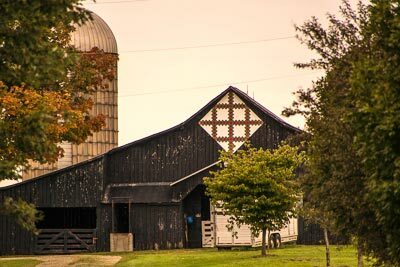 After all, you can’t go wrong in the scenic countryside, even if you miss a barn or two along the way.